25 years passed since State Socialism in Eastern Europe collapsed. The so called “Screen Memories Festival” wants to commemorate this era by showing different movies about this time produced in various countries. The festival was organized by the Goethe-Institute, the cultural institutes of Bulgaria, Estonia, Poland, Slovakia, and the Czech Republic in cooperation with the Institute for Art Theory and Media Studies of Eötvös Loránd University, and it took place in November 20-26 at Toldi Mozi, a must go place in Budapest. It also included an International Conference about this topic. Foreign people in Budapest always have trouble to find a Cinema that screens movies with English subtitles, or just movies in English. But the filmfestivals in art-cinemas like Toldi mozi and Művész mozi always offer films with subtitles. One of the movies we’ve watched was Disco & Atomic War, an Estonian story/documentary, released in 2009, that is about growing up in the Soviet Union and how the Finnish TV had entertained Estonians, and even Russians, a bit later, during the Cold War. The movie shows what happened when the Finnish TV started screening movies like Ninotchka and many other kinds of Hollywood movies, including Star Wars. These movies reached Estonia by Finland. It was an affront for the soviets, so they tried to stop the access of the powerful transmitter near to Helsinki to Estonia but they couldn’t avoid this. The iron curtain was somehow opened to the free world. It was a great experience to watch this movie, because the audience seemed to enjoy it as much as I did. Initially, it seemed a very serious movie, but we all laughed together about the jokes about the Soviet advertising many times. The second movie we’ve watched was 80 million, released in 2011. “80 million” is a movie about the state of emergency proclaimed in Poland in 1981. From December 13, 1981 to July 22, 1983, the authoritarian government of the People’s Republic of Poland drastically restricted normal life by introducing martial law in an attempt to crush political opposition. Thousands of opposition activists were interned without charge and as many as 100 people were killed. In this political context, the movie depict the friendship of a few Polish, patriots of the Solidarity union, wich decide together to withdraw 80 million of the organization’s money out of bank. The money will be used to create the underground of the resistance movment. It was a great movie, really interesting, and based on true events, wich allowed us to discover a context we didn’t know well before, wich is the Poland’s context between 1981 and 1983. Even if we had already heard about repression in Poland, in tv-reports, watching a fiction on it is so different, because it bring a completely different point of view. Cinema brings some romance, drama, and 80 million kept us fascinated all the long. 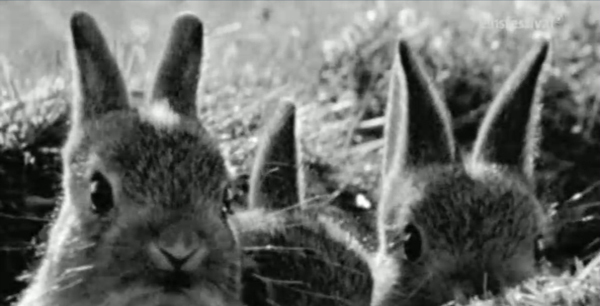 Last but not least we´ve watched a whole movie about rabbits. But why is there a movie about rabbits at a festival called “Screen Memories”? “Rabbit à la Berlin” is a Polish/German Production released in December 2009. The documentary tells the story about a huge rabbit population living between the Berlin Walls at Potsdamer Platz for 28 years. Germans from East-Berlin were shot dead on this greenfield. It was part of the “Death Zone”. But for the wild rabbits it seemed to be heaven. No natural enemies, protection by German soldiers, enough grass to eat every day. But there is always an up and down in life and during the years their existence changed. The same grass every day, nothing new to discover, lethargy. Then the soldiers got the instruction to shoot the wild rabbits. This movie seemes to seriously display the years of the rabbits in death zone, but somehow it is a methapor for citizens of East-Berlin. When the wall fell down the rabbits and the citizens of East-Berlin started to discover a new world full of challenges. “Rabbit à la Berlin” won many awards and was even nominated for an Oscar. As you can see, the festival brought many memories about the socialist state and we’ve chosen three great movies that were shown in the festival: “Disco & Atomic War”, “80 million” and “Rabbit à la Berlin”. Screen Memories was a success. We definitely recommend visiting the small filmfestivals in Budapest. You want more information about the idea of Screen Memories? Click here for our interview with Lazlo Strausz, the organizer of the festival. A blog run by local and international students studying at the Department of Media and Communcation Studies, ELTE, Budapest.